A REMINDERthat we are running our hands on clinic on the long weekend in June. We only have a limited number of vacancies, if if you are interested in attending and want more information please let us know. Please phone Ross 0429204026 or Miriam 0427204205. ORDER NOW - We are now taking orders for our next shipment of Show Carts, Work & Training vehicles and Harness. If you would like a Show Cart and have a preffered colour let us know as we can order them in any colour you require. They arrive in Australia ready to just hook up to your horse and go to the show. CONGRATULATIONS:to all our clients who have purchased show carts and or Harness who competed at the 2013 Sydney Royal Easter Show. You all went home winners taking home ribbon/s ranging from Grand Champion Delivery Horse, Reserve Champion Delivery Horse, Firsts through to sixth place getters. Well done, you all looked great out in the ring. Hope to see you in Melbourne. Our NEW Shipment has arrived into Australia from the USA. It will be here at the showroom by the end of this week. Great for light loads and training your horse. Our latest shipment of vehicles will be landing in early September followed by our other container arriving in late October. Draught horse show shoes in several styles will be avaliable in late October. Just reminding you that we stock many items for smaller harness horses down to miniatures. Some new carts in the next shipment to suit. We will keep you informed when the next driving clinic will be held. 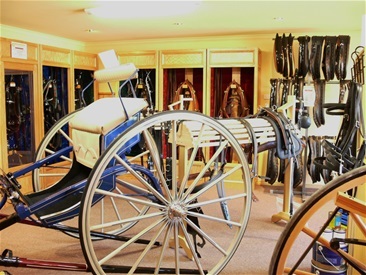 Equestrian Australia has launched their Carriage Driving High Performance Program in Australia.